In early maps of the world, drawings of sea monsters signified unknown marine territory, and since the beginning of cinema, such creatures have been rife in Hollywood. Today these beasts are experiencing a cultural renaissance, as images of washed-up monsters frequently go viral online. 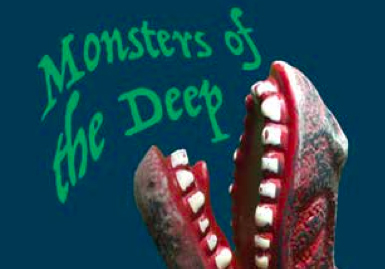 Are they click-bait hoaxes striving for online attention, and if so, why has there always been this cultural need for ‘monsters of the deep’ as signifiers of otherness? Instead of answering this complex question, performance artist Louise Ashcroft has founded the rock band Monsters of the Deep and is organising a monster-movie music concert on the roof of a public toilet overlooking the waves, in the hope of summoning the creatures themselves. Exploring how we conjure monstrosity through sound, the performances will feature interpretations of soundtracks from monster action scenes in films like It Came From Beneath the Sea and Attack of the Crab Monsters. If you’re a local musician or band who would like to take part please email monstersofthedeephastings@gmail.com. Louise Ashcroft has exhibited at The Government Art Collection, Latitude Festival, Arebyte, AVU Prague, TEDx Hackney, Turner Contemporary, Modern Art Oxford and comedy festival The Boring Conference. She studied at Oxford University, Birkbeck and The Royal College of Art and was recently in residence at Tate Modern and Camden Arts Centre. Louise makes live performances, videos and installations reflecting upon cultural behaviours and traditions.